Expect a white-tablecloth setting in the wood-paneled dining room of The Brown Hotel. 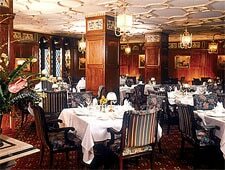 : Oil paintings of famous racehorses line the dark oak-paneled walls at The English Grill. Crewel upholstered chairs at the candlelit, linen-draped tables laid with gleaming silverware invite guest to relax and linger. Formally clad servers accommodate guests with alacrity. Chef Josh Bettis’ ever-changing menu will inspire repeat visits: truffled cauliflower or minted pea bisque; greens with strawberries and creamy bourbon sorghum dressing; roasted rack of lamb with bourbon-cherry demi-glace; butter-poached halibut with white asparagus. The ever-present Hot Brown, the signature dish of Louisville, was invented at the hotel in 1926; it’s a cross between a sandwich and a casserole, layering turkey and bacon slices over toast, smothered in a savory mornay sauce and broiled until the cheese bubbles. Among the ever-changing desserts, go for any flavor of crème brûlée. A 200-plus-bottle wine list features selections from across the globe, as well as from Kentucky’s best wineries.